Monday, Tuesday, Wednesday & Friday we are open from 9:00 AM to 5:30 PM Thursday we are open from 9:00 AM to 8:00 PM Saturday we are open from 9:00 AM to 4:30 PM We are closed on Sunday. Hours can change without notice (emergencies, weather, etc.). We are typically closed for major holidays such as: New Years, Memorial Day, July 4th, Labor Day and Thanksgiving. Although we are not a true "fabric store", we do carry all of the Maywood fabrics and embellishments required to make virtually all of the Kimberbell design sets that we sell. In addition, we do carry a variety of fat quarters and fat quarter sets. If you are looking for a wider variety of fabrics for quilting, clothing, crafting etc. we would recommend Stitch Chicks in North Franklin or Quilting By The Yard in Vernon. OK, this question I could write a book about. The overall answer is a resounding NO (there are some exceptions when dealing with handvacs and electric brooms). The main reason is that, in general, the bagless vacuums actually cost more to operate, are dirtier and have a significantly shorter life expectancy than comparable bagged units. In our opinion, many brands (including Dyson, Euro-Pro, Bissell) are designed to look impressive but in the end are not the best performers or have significant longevity issues. This is another virtually impossible question to answer. The short of it is that the "best" vacuum is the one that best fits your needs and your budget. That is why we are here. Our goal is to understand your needs and to help you find the vacuum cleaner that best matches what you are cleaning and fits a budget that you are comfortable with. With almost a hundred different vacuum cleaners to choose from we are pretty good at being able to find the "right" one for most everyone. Do we prefer upright or canister vacuums? Again, that depends upon your needs. If the primary type of surface that you are cleaning is rugs then an upright vacuum will work best. If most of what you are cleaning is bare floors then a canister vacuum is a better choice. Upright vacuums clean by agitating the rug so that the dirt is lifted to the surface and then pulled away by the air flow. Canister vacuums typically have much more suction and work in conjunction with attachments like a bare floor tool. If you have a mixture of both bare floor and rugs then a canister with a motorized power nozzle would be appropriate. What charge cards do you accept? We accept MasterCard, Visa, Discover, and American Express. We also accept bank debit cards. In addition, we offer in-store financing through Synchrony Finance. Do you have long-term financing? Yes, we utilize Synchrony Finance to provide our customers with the ability to finance their purchases. We can process your application here in the store with virtually instantaneous credit decision. Synchrony does work with a number of our vendors (particularly Brother, Baby Lock and Elna) to periodically offer extended term (18 to as long as 60 month) long-term 0% interest financing options. What is your turnaround time on sewing repairs? Although we can never know exactly how many sewing machines will be in for service at any time, the typical turnaround time is 1 week (or less). We can usually give you a more precise estimate when you check in your machine. What is your pricing for sewing machine repairs? General service labor for sewing machine repairs is: * Mechanical (non-computerized) machines: $79.95 * Computerized (electronic) machines: $89.95 * Embroidery machines: $99.95 * Long-Arm Quilters: $129.95 Parts not included. What brands of sewing machines do you repair? We can service virtually every brand and age of sewing machine made. We are the factory service station for Brother, Baby Lock and Elna. The only limitation we can have is if electronic components are needed for brands of sewing machines that we do not sell. Do you only service sewing machines that are purchased there? Emphatically NO! We will service your sewing machine no matter where it was purchased. We can only provide warranty service for those brands that we sell (Brother, Baby Lock. Elna). Do I need to make an appointment for service? No. You can bring your machine in anytime we are open. We will do a preliminary check of your machine when we are checking it in to determine what service work needs to be done. We will provide you with both an estimate of the repair charges and time needed to repair your machine. Is there a charge to diagnose the repairs needed? Typically not. The only time we assess a "bench charge" is if we need to disassemble your machine to determine the cause of your problem and you decide not to repair your machine. Bench charges are typically in the range of $20 - $25. No. We assume that you have every intention of coming back for your sewing machine. What do I need to bring with my machine? Typically we ONLY need your machine. You can leave your power cord, foot control, thread and accessories at home. We do ask that you put your regular foot for straight stitch/zig zag sewing on the machine. In addition, although you can certainly transport your sewing machine in any portable case/cover we will normally send it back home with you. I have an embroidery machine...Do I need to bring my embroidery arm? Normally we only need your embroidery arm if it is malfunctioning. If you happen to own an "older" embroidery machine you may want to check if we have an available embroidery arm and/or embroidery hoop for your machine. Yes. We service sewing machines no matter how old. If the sewing machine requires more "restoration" than "repair" additional charges may apply. The only time that we may not be able to repair your antique machine is if there is significant rust. Please NO! Most all flat bed sewing machines will come out from your cabinet the same way. Flat bed sewing machines (the type located in most older cabinets) all mounted on two hinge pins. Your sewing machine is held on these pins by two set screws (one per hinge pin). If you tilt your sewing machine back and expose the bottom of the machine, you will see these set screws by each hinge pin. Loosen the screw a couple of turns and the machine should lift off the hinge pins. Do we buy old sewing machines? Sorry, but we cannot buy old sewing machines. If you have an older machine that you are no longer using we can have the machine recycled. How do I know that my repairs are complete? One of our service technicians will typically call as soon as the repairs on your machine are complete. If you are not home we will leave a message (if able). You are welcome to contact us if you do not hear from us in a timely manner. If you would like to be contacted by email and/or text please let us know. What is your turnaround time on vacuum repairs? Although we can never know exactly how many vacuum cleaners will be in for service at any time, the typical turnaround time is 1 week (or less). We can usually give you a more precise estimate when you check in your machine. What brands of vacuum cleaners do we service? We can service virtually every brand and age of vacuum cleaners made. We are the factory service station for all brands that we sell including: Miele, Simplicity, Sebo, Hoover, Eureka, Electrolux. The only limitation we can have come with servicing machines from companies that have a limited number of replacement parts. This includes some major companies such as EuroPro/Shark and Dyson. Although we can still service these brands the availability of many components can be significant. My vacuum is in warranty. What do I need to bring? If it is a machine that you purchased from us we will have all the information needed concerning your purchase so you do not need to bring anything other than the machine. If your purchased it elsewhere it is best if you can provide proof of purchase in the form of your purchase receipt. Do we only service vacuums if they were purchased at Schillers? NO. We will service your vacuum cleaner no matter where it was purchased (even online). No. You can bring your vacuum in any time (that we are open). although we will typically do an initial evaluation of what repairs need to be done (sometimes they may be minor), you should expect that you will be leaving your machine for service. We only need those parts of your vacuum cleaner that actually need to be repaired or are required to operate your vacuum (some canister vacuums require their hose to operate the vacuum). That is a much more difficult answer to give before we actually have your vacuum cleaner in our store. Labor charges for repairing your vacuum can range from just a bench charge (typically under $20) to $70 for the most complex repairs. We can always contact you to let you know the estimated charges before we repair your vacuum. Since additional charges for required parts may be appropriate this can certainly affect the total cost of repair. We understand that you only want happy surprises. Why don't I see prices on your sewing machines? Unfortunately, Brother, Baby Lock & Elna all restrict the sale of their sewing machines to in-store sales. This also means that we cannot put the prices of any or our sewing machines on our website. The only price that you will see anywhere online is the Manufacturers Suggested Retail Price (MSRP) which we NEVER sell our machine at. Can you ship your sewing machines? For the same reason as to why we cannot put pricing on our sewing machines, we are not allowed to ship a sewing machine unless it is purchased either in our store or at one of our events. Sorry. What machines come with 5 years of unlimited maintenance? In general, any of our sewing machines that retail for $499 or more will come with 5 years of unlimited free maintenance. Unfortunately, this does NOT include any of our sergers since they naturally produce a significant amount of cutting debris and should be cleaned after each use (or at least fairly frequently). What Brands of sewing machines do you carry? We are proud to carry the Brother, Baby Lock and Elna product lines. Although, over the years we have carried virtually every brand of sewing machines, some brands (that we have eventually discontinued selling) have definitely not maintained the high quality standards for both production and service that we insist upon. In general, the sewing machines that are sold online are intended to be a lower tier of machines that the various companies typically do NOT put into their dealerships. 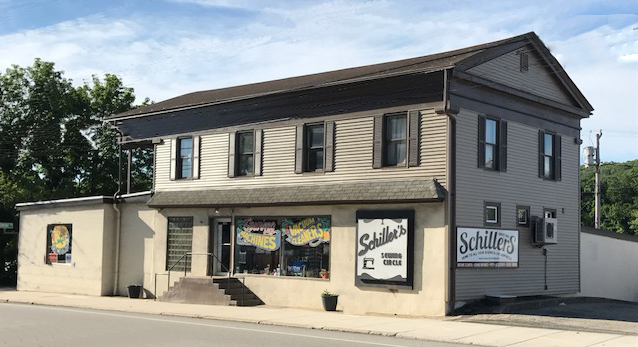 Although many of these machines (certainly those sold by Brother) are superior to those sold online by their competitors, they will not come with the beneficial service and support provided by dealers such as Schiller's. Do you carry all of your sewing cabinets in the store? We would need a truly enormous store if we tried to carry all of the sewing cabinets that we sell. Since we handle the cabinets from a number of manufacturers, and most cabinets are available in different finishes, having in-store samples of them is not feasible. We DO have on display a significant selection of Koala sewing furniture. All sewing furniture is ordered and shipped directly from the manufacturers. In many cases your cabinet will be shipped directly to your home. Is there anyway for me to have a sewing machine shipped to me? Not really. The only way is if you know someone that can come to our store and purchase the sewing machine from us. they certainly can ship the machine to you. How do I get training on my sewing machine? We will provide unlimited free training and instruction on your sewing machine for as long as you own it. Training is done in a one-on-one format. Typically we recommend that you give the store a call and we can find a mutually available time for you and an instructor. If you are trying to get training on a Saturday or Thursday evening (our only evening hours) it may be a little more difficult to quickly arrange a time slot. Instruction is provided on virtually any aspect of your machine both functionally (ie. how do I make it work) and practically (I am trying to do "this"...how do I do it properly). Our goal is to make you a success in using your machine. Like their sewing machines, Brother does not allow dealers to ship the CM650W. They will sell online the lower version(s) with less features. We are obviously partial to the CM650W. How do I register for a class or event? Our online calendar will show you all of the group classes that we have available. We have them color coded such that if a class is show in green it has available spaces, if it is shown in red it is already full. Once you find the class/event you want to attend simply click on the "Register Now" button and fill in the required information. If you have logged into your account (you will be prompted to create an account if you don't already have one) all of your saved information will be entered for you. If the class/event has a registration fee you will be prompted to enter the appropriate payment information. You will receive an email confirming your registration. You will receive additional email reminders as the event draws near.